I woke up this morning convinced it was November 30th, Wow, December 1st already? One of my teacher's in hair school would always say "Christmas is right around the corner, you better start saving now!" Well sorry Mr. Mike I didn't heed your advice this year, better planning next year. Thankfully most of my gifts are handmade so I just need to start whipping stuff out like crazy. Have you started decorating your hearth for Christmas yet or are you one of those "been there all done with that" kind of people? We do Christmas on a small level, Our house is kind of painted and decorated with fall & Christmas colors already so adding a lot of ribbon, bows and tinsel would overwhelm it all. 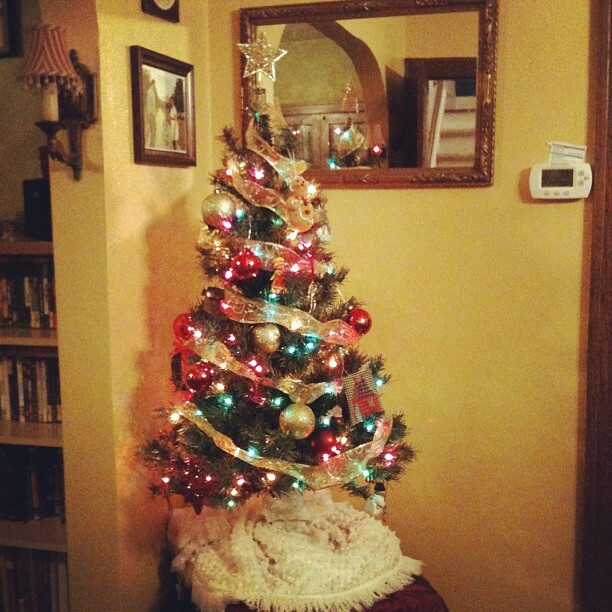 We have our 4 ft. Christmas tree set up in the corner of our dining room. Brett did most of it while I took pictures and kept Adelle from pulling off the bulbs. Adelle calls it her "Pretty Tree!" 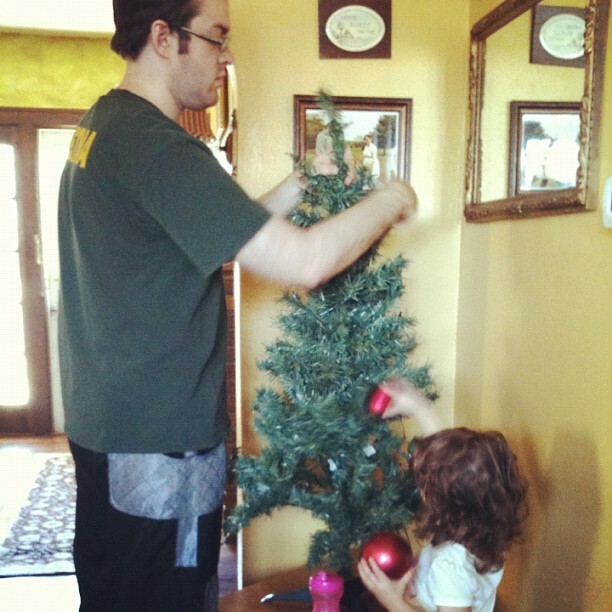 It was pretty funny, the day we decorated it Adelle woke up from her nap and yelled "TREE!" She came running out to stare at it and play with the little nutcracker ornament. 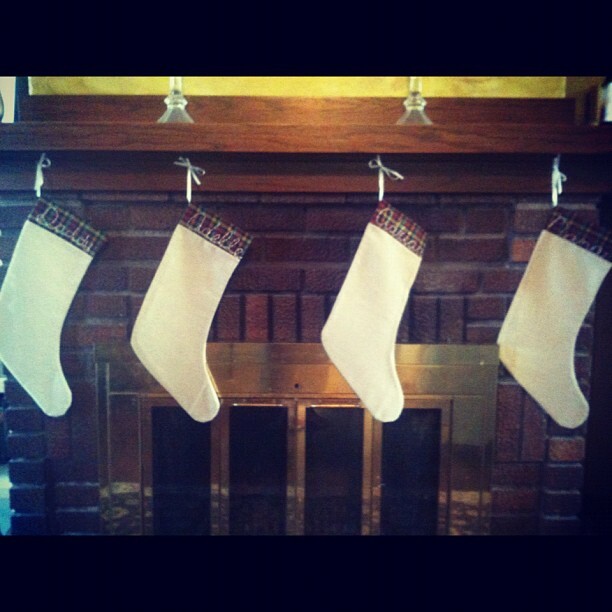 We got our stockings hung. I whipped these up this past week. We had different ones that I made but I wanted to simplify them a little and use one of my favorite pieces of fabric to deck the top of them. Our names are all "embroidered" on by my own doing, the reason for the quotations. Adrian's was the last I made. This week Adelle is at her Aunt & Uncle's farm, she has a little cold that hopefully she's recovering from, but I can't wait to get the pictures of her petting the goats and taking care of the chickens. She loves going out there. While Adelle is busy playing I'm finally feeling up to doing a few baby projects. I whipped up a U-shaped nursing pillow for little Adrian, along with the cover, now I have a few screen printing ideas to do on some black Friday onsies I scored. Some pants and a sling to make and a blanket that I am dieing to knit! I kind of need to learn to knit first. A winter project. Hmm maybe I'll work on that a little today. If you're interested in learning to knit Martha Stewart has a tutorial I plan on looking at and watching. Check it out at MarthaStewart.com and we can be knitting buddies! Well enjoy your first day of December 2012!